Check out our Featured NBA Free Picks for similar articles. The San Antonio Spurs need to be wary of a letdown when they take on the basement dwelling Brooklyn Nets. The Spurs are coming off a 118-105 overtime victory over Cleveland, going from a best to worst scenario. 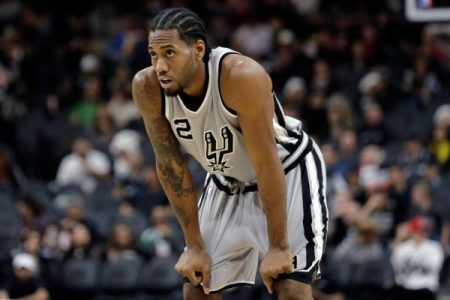 San Antonio (24-9, 25-17 ATS)has taken the last three in the series, including a 130-101 home triumph on December 10. Kahwi Leonard had 41 points in Saturday’s overtime victory over the Cavs and has scored 30 or more points in his past six games. The Nets (9-34, 20-21 ATS) have lost nine of their last 10 to fall further into the abyss of the NBA basement. They own a five-game lead over Miami for the worst record in the league and it doesn’t appear a change is on the horizon. Surprisingly Brooklyn is a respectable 11th in scoring with an average of 106.2 points per game. The problem lies on defense where they’re dead last allowing an average of 114.9 points per game. San Antonio is as solid as they come: they’re 7th in scoring 107.6), 2nd in defense (98.9) and has the third best ATS record in the league. The Spurs are 8-2 SU in the past 10 meetings, 13-3 ATS in the last 16 meetings in Brooklyn and 22-7-1 last 31.Overall the Spurs are 15-5 ATS in their last 20 games overall. The Nets are 3-9 ATS in their last 12 overall and 1-4 ATS last five against the Western Conference. The UNDER is 6-1 in the last seven series meetings in Brooklyn.